« TANGO VALS THIS TUESDAY – AT DANCEWORKS! 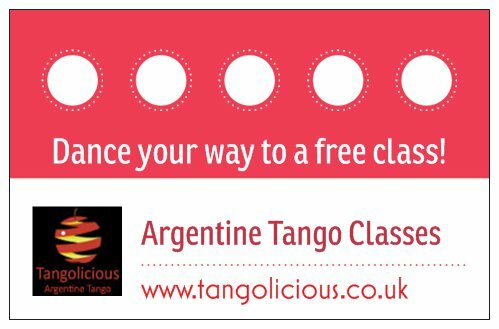 Loads of people have been contacting us lately asking for tango classes in Chelsea. We have held classes at several venues in the area over the past year and a half but hadn’t, until now, found that perfect place – a place with huge mirrors, a giant dance floor, great changing rooms, all newly decorated and situated in an ideal location just off the fashionable hub of the King’s Road. After months of searching and waiting, it looks like we have found the right spot for our Tangolicious Chelsea classes and this will be announced as soon as everything has been signed and sealed! We will be holding the class every Thursday from 8.00-9.00pm as of January 7th 2016. The class will cost £15 with no membership fee to pay. And. like all the classes, every 6th class is free with our loyalty card! Next Milonga Saturday 27th April 2019!